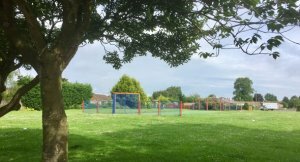 Cam Parish Council is also conducting a Play Review to discover what parishioners of Cam would like to see at Woodfields Play Area. If you would like your say please get in touch. Contact details can be found at the top of the page. This play area was updated with a variety of new equipment in 2008, with a pod swing added more recently. It includes a selection of equipment for children from pre-school to around 12 years of age including a swing, multi activity unit, spring rockers and interactive panels. There is a very good size field to run around in and has football goals available for all to use. 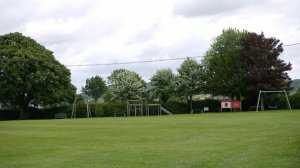 Cam Parish Council is also conducting a Play Review to discover what parishioners of Cam would like to see at Cam Green. If you would like your say please get in touch. Contact details can be found at the top of the page.